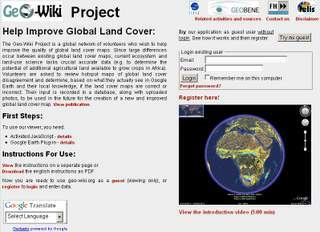 The Geo-Wiki Project is a global network of volunteers who wish to help improve the quality of global land cover maps. Since large differences occur between existing global land cover maps, current ecosystem and land-use science lacks crucial accurate data (e.g. to determine the potential of additional agricultural land available to grow crops in Africa). Volunteers are asked to review hotspot maps of global land cover disagreement and determine, based on what they actually see in Google Earth and their local knowledge, if the land cover maps are correct or incorrect. Their input is recorded in a database, along with uploaded photos, to be used in the future for the creation of a new and improved hybrid global land cover map. Geo-wiki now also shows the FRA2010 10km and 20km tiles so you can see what vegetation type is shown in 3 different global land cover products from MODIS, GLOBCOVER and GLC2000 Global Land cover map from the year 2000.